You might know that I was recently diagnosed with a mild/moderate hearing loss (you can read more about that here). This has been a huge learning experience for me, as I am now facing how bad my hearing really was before I did anything about it. I am hearing some sounds for the first time in a long time, and it can, quite frankly be overwhelming. When I went to my shower in Rochester, I flew by myself. I have done this many times before, but this is the first time since wearing hearing aids. I had a lot of concerns, specifically about airport security, and riding on the plane. Would I have to take my hearing aids off? Would I want to? -Make sure anything you might need for your listening device is stored in your carry on. I had a case with an extra set of batteries in my purse, and then carried on some more batteries in my carry on. I didn’t want to be in the situation if my luggage was lost, that my hearing aids would be dead. -You CAN walk through the metal detectors with hearing aids on. I found that I was more comfortable letting the TSA agent know that I was wearing them, but they suggested I leave them on. This makes for a much faster security check, if you aren’t taking out and putting your aids back in. -Sign up for text alerts. At one point, my gate changed, but I could not for the life of me understand the announcement over the loudspeaker. But since I was signed up to receive texts, I got the message right to my phone, and moved to the new gate. -Most airports are equipped with a hearing loop. If your device has t-coil connectivity, this might be a better way to hear announcements in the sometimes loud airport concourses. I was using mine for a while at LaGuardia, but found it distracting, as I was hearing all the announcements that I didn’t need. 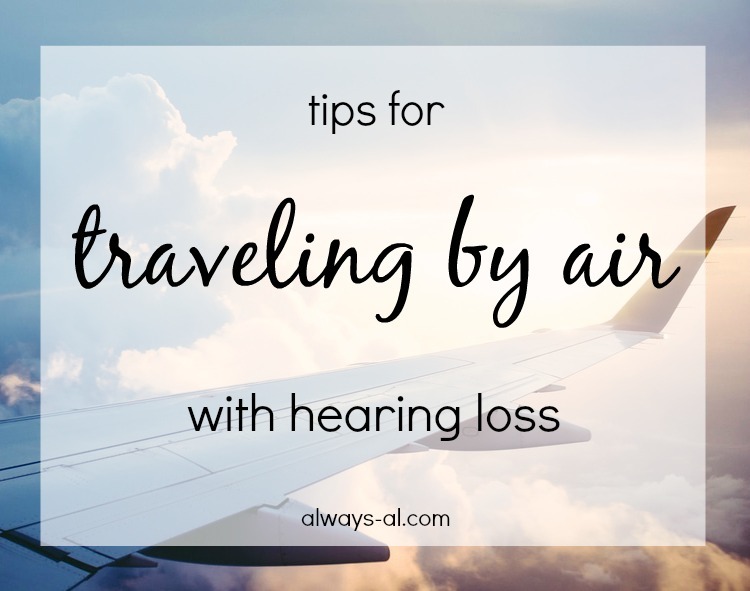 -Hearing devices do not interfere with the plane’s instruments. You are not required to turn off devices when they make the announcement to the cabin about “electrical devices.” You can continue to use your hearing aids or personal listening device through the flight. I found that I was more comfortable (and could sleep) with my hearing aids off, but that was my choice. -The plane might seem really loud during flight. I recommend either turning hearing aids down, or if you are able to turn them off. This will prevent any noise damage. -This is personal preference, but if you don’t feel comfortable sitting in an exit row, by all means ask to have your seat changed. In the event of an emergency, not being able to hear directions well would be a good reason to not be in that row. -Most importantly: do not be afraid to ask for help! When we were preparing to land, I absolutely could not understand what the captain was saying over the intercom. I turned to my seat-mate and said, “I’m sorry, what did he say?” and she was kind enough to repeat it. Most of the time people are very gracious and willing to help. Do you have a hearing loss? Do you have any tips for traveling by air?